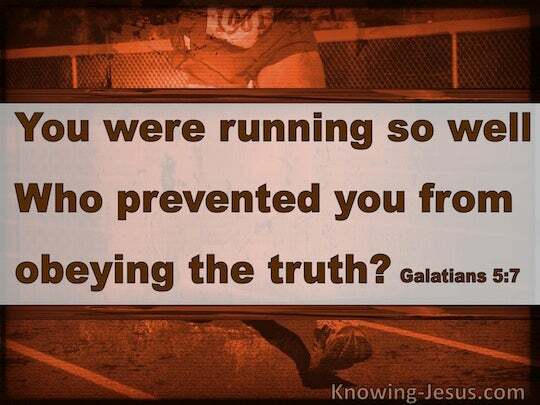 ﻿ Galatians 5:7 You were running well; who hindered you from obeying the truth? You were running the race beautifully. Who cut in on you and stopped you from obeying the truth? Ye were running well. Who hindered you, not to obey the truth? You [Christians] were running [the race of life] well; who hindered you [from making further progress] so that [now] you are no longer obeying the truth? You were running well; who kept you back from obedience to the truth? You were going on well; who was the cause of your not giving ear to what is true? You set out well in your course: who hath obstructed your progress in the truth? Ye ran well; who has stopped you that ye should not obey the truth? You were running well; who did hinder you that you should not obey the truth? You were making such progress! Who has stopped your obeying the truth? Ye did run well: who hath hindered you, that ye should not obey the truth? Ye did run well; who hindered you that ye should not trust in the truth? Ye were running well; who hindered you not to obey the truth? You did run well; who did hinder you that you should not obey the truth? You were running well. Who hindered you that you do not obey the truth? Ye did run well. Who was a let unto you, that ye should not obey the truth? You were doing splendidly. 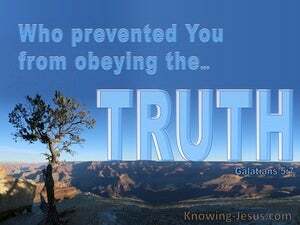 Who was it that prevented you from obeying the Truth? You were running your race nobly. Who hindered you from obeying the truth? You were running well; who prevented you from obeying the truth? You were running well. Who interfered with you that you should not obey the truth? Ye were running well; who hindered you, that ye should not obey the truth? 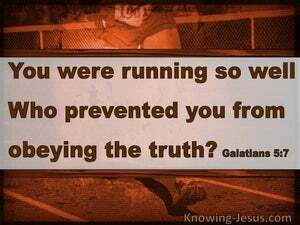 You ran well; who hindered you from obeying the truth? Ye were running well: - who hath hindered you, that, by truth, ye are not to be persuaded? Ye were running well: who hath hindered you that ye should not obey the truth? You were once making good progress! Who has hindered you from obeying the Truth? Ye did run well, who hindered you that ye should not obey the truth? You were running the race nobly! Who has interfered and caused you to swerve from the truth? You were running beautifully! Who was it that cut into your way and kept you from obeying the truth? You were running well! Who interfered with you that you should not obey the truth? Ye did run well: who hindered you from obeying the truth? Ye were running well; who did hinder you -- not to obey the truth? 6 For in Christ Jesus neither circumcision nor uncircumcision means anything, but faith working through love. 7 You were running well; who hindered you from obeying the truth? 8 This persuasion did not come from Him who calls you.